Munich - No matter what happens in Morocco, 2013 will go down as the most successful and arguably most sensational year in the history of FC Bayern München. With four titles already in the bag, Pep Guardiola took his troops to northern Africa on Saturday fresh from a 3-1 win over Hamburger SV which ensured the European champions' best ever first half to a season, aiming to put the fifth piece of silverware in the cabinet - the FIFA Club World Cup. "I'd like to congratulate FC Bayern on a sensational year," said Guardiola, who took over from the retired Jupp Heynckes in the summer, assuming only part of the responsibility for an unrivalled achievement. 17 home matches, 17 Bundesliga wins in the calendar year; 41 league games since their last defeat all told. 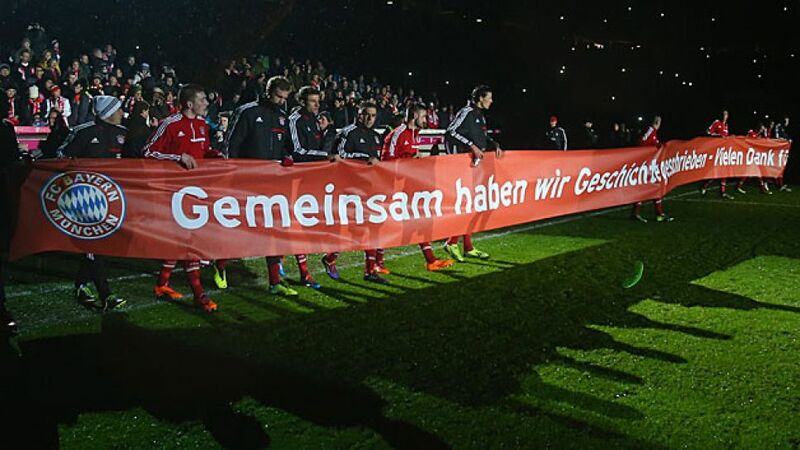 "We've written history together," read a banner Germany's most successful team ever held up to thank their 12th man in Munich. 44 points from 16 games is the best record any side has ever delivered from the start of a season. They managed that many from 17 games in 2005/06, but a year ago, they only had 41 points at the same stage of the season. Ominous signs, then, that his Bayern team have not lost their record-breaking hunger at all. In fact, it seems to have been further fortified. In 15 of the past 18 seasons in which Bayern led the way at the turn of the year, they went on to win the league title. At worst, Guardiola's side have theoretically already secured a place in Europe next season as only one side - 1899 Hoffenheim in 2008/09 - have dropped between January and May from top to seventh. Statistically, Bayern have never finished lower than second after being crowned Herbstmeister. On Monday, they will discover who they will face for a place in the last 16 of the UEFA Champions League, yet that is not likely to worry them in the slightest. After all, the defending champions are not only domestically the most feared side around. "We're not finished yet," clarified captain Philipp Lahm, who already had his sights set on the Club World Cup. "We still have high hopes for next week and we'll give it our best to ensure we win our next trophy, and then we can be satisfied with the year." Fair comment from the man who finally got his hands on silverware for the first time as the side's skipper in May, and clearly has not grown tired of the additional weight training. With a grin on his face, he had a warning to the rest of the world: "We want to be just as successful next year." Indeed, rather than weakening, Bayern seem set to strengthen further when the second half of the season comes around. Bastian Schweinsteiger is due to return from injury, Arjen Robben should also be back for the restart and both Thiago Alcantara and Javier Martinez will benefit from a full mid-season warm-up after missing most of pre-season and the early days of the campaign. Mario Götze, meanwhile, has put his niggling injury behind him, while Guardiola's methods and philosophy are no longer being learned, but rather refined. With all that to look forward to, Bayern have arrived in Morocco, where they will be bidding to lift aloft the Club World Cup on Saturday. Their biggest challenge, it seems, is not just winning further trophies, but finding room in the cabinet for them.